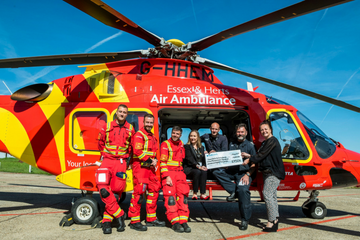 Volunteering with Essex & Herts Air Ambulance is a rewarding experience and keeps our local life-saving Air Ambulance service flying. Please complete this application form to join our friendly team – even a few hours can make a real difference to us. Age restrictions may apply in some circumstances. Which of our Charity Shops would you like to work in? Please tell us any other areas you would be interested in. Please provide the name, relationship and telephone number of someone who can be contacted in the event of an emergency. We require two references (referees must not include relatives either direct or indirect/spouse/partners or an existing Essex & Herts Air Ambulance Staff member or Volunteer.) These must include: One from Employer/Ex Employer or Professional acquaintance. One from close friend/colleague. Please provide the full name and postal address including postcode. This should be a close friend/colleague. How did you hear about volunteering with EHAAT? The photo should be head and shoulders only and have no one else in the background. Maximum file size is 100MB. By agreeing to be a Volunteer you consent to Essex & Herts Air Ambulance (EHAAT) collecting, storing and processing certain personal data about you. Your data will be used to send you information about your involvement as a volunteer with EHAAT and to keep you informed about EHAAT events and fundraising campaigns. Your data will not be forwarded to any parties outside of EHAAT.